Please take time to read the whole description. There's much more here than meets the eye!!! === I ACCEPT ALL TYPES OF PAYMENTS ===. >>> STATUE # 4 <<<. >>> Please make sure to watch the video on youtube in 1080p HD <<<. There is no other statue like this in existence!!! No company in the world makes them. This is your one chance to own such a detailed collectors piece. This statue was carefully handcrafted over hundreds of hours to ensure that every single detail was true to life. If you are a TERMINATOR collector, then you likely already know that this is strictly a one-of-a-kind statue of Arnold Schwarzenegger (The Terminator). Below are some of the unique attributes of this work of art. 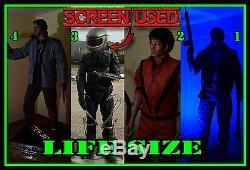 The Terminator (TECH-NOIR) 1:1 Scale LIFE-SIZE. 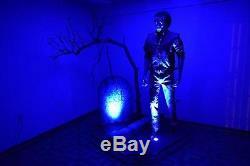 This is a one of a kind life size Approximately 6'2 tall Terminator statue. The Terminator was made from the highest quality materials available. 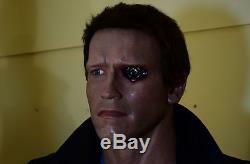 It is the most realistic Terminator ever made. Plus, he was made with incredible attention to details to look just like in the movie. 33" x 28" (84cm x 71cm). MORE PICTURES UNDER THE DESCRIPTION. This statues head was professionally painted to look like a real skin. His eyes are constructed from the highest quality orthopedic glass in order to produce a realistic look. This statue also features real hair including the eyebrows and eyelashes. Moreover, sweat effects were added to make his skin look even more realistic and human like just like it the TECH NOIR Night Club Scene. Additionally, the mouth, nose, cheek structure, and overall skin tone have been carefully crafted in order to mimic that of the Terminator icon. The statues hands are extremely realistic, with perfect anatomical curvature and design. The hands were carefully crafted and this attention to detail can be clearly seen in the cracks and grooves of the fingers and even the slightly elevated presence of major veins etc. One of the most impressive features of this work of art is the implementation of the authentic TERMINATOR outfit just as it appeared on screen. This includes the Mega Rare (GRAY) M65 Jacket and pants along with shirt, and motorcycle boots. Furthermore, the boots he wears are also screen accurate version of the T-800 boots. These boots were taken and AUTOGRAPHED at the COMIC BOOK and SCIENCE FICTION CONVENTION in 2003 by various actors, such as: Arnold Schwarzenegger, Kristanna Loken (Terinatrix), Nick Stahal (John Conor), Jonathan Mostow and Stan Winston. Autographs come with a Certificate of Authenticity obtained at the convention. Boots were also signed at the HOLLYWOOD SHOW CONVENTION in 2010 by Robert Patrick T-1000, Sarah Connor - Linda Hamilton, Michael Biehn - Kyle Reese, Edward Furlong -John Connor. Adding to the overall quality of this work is the fact that THE TERMINATOR. Built into his mouth in order to facilitate the impression that he is actually speaking When you press hidden spots located on his chest it makes the Terminator say (with an AUTHENTIC -Terminator VOICE) different phrases that Arnold Schwarzenegger actually spoke in the film. He comes programmed to say phrases like. Nice time for a walk. Your clothes give them to me Now. Furthermore, THE TERMINATOR can be reprogrammed to say virtually anything (there is no limit). The display base features a VERY powerful custom made speaker that PLAYS 25 tracks of music including Foreign and Domestic Theatrical trailers including 20 Minutes of the James Cameron and Arnold Schwarzenegger interview, plus much moreYou can choose between different tracks etc including standard on/off, mute, play/pause, track selection, sleep/repeat and volume controls plus much more.... You have full control of the music! The Terminator (Arnold Schwarzenegger) stands atop an impressive Display Base - it features METAL tread plates which give an 80's look. In addition to the display base it says -The Terminator - painted with LARGE RED letters on the bottom side of the display base. ALL lights and tracks are ALL REMOTE CONTROLLED. You can adjust speed, intensity of each light etc. 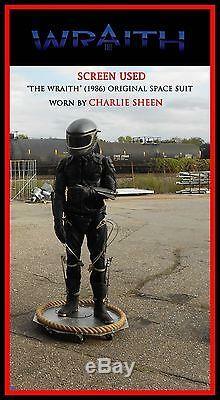 This Terminator LIFESIZE Statue comes with the. The Terminator (T-800) holds AMT. 45 Hardballer LONGSLIDE with a LASER SIGHTING. This pistol is fully made out of Stainless Steel METAL plus, the laser sighting actually project a. Just like a real gun!! The Terminator also, holds an UZI 9mm Submachine Metal/Plastic body Submachine gun. The T-800 obtained an Uzi 9mm from a pawnshop in Los Angeles, and subsequently used it at the Tech Noir night club in his attempt to terminate Sarah Connor. This Uzi 9mm has a SUPREME craftsmanship & TOP NOTCH finishing, just like the rest of the guns in statues Please check the pictures. Also, I would like to point out, that both guns looks and feels just like a real thing. This is no longer a live ammunition anymore and it does not. AMMUNITION DOES NOT CONTAIN PROPELLENTS NOR EXPLOSIVES!!!! The Display Base also features a built in blue light Projector, which projects a MOVING light that creates incredible Night, Smoke, like effects and atmosphere seen in the movie. The built in Projector, also projects blue & red POLICE FLASHING LIGHTS in order to create the Night Club atmosphere as seen in the movie. Plus the base features an EXACT Tech-Noir flashing lights, this Tech Noir lights could be lit up in variety of colors, speed etc You have full control of the statue/display base. Moreover, on the front side of the display base it says THE TERMINATOR. In addition to the display base, the music control panel features a unique Cyberdyme Systems Logo that also lights up BLUE. If You'd like to see MORE pictures or have any questions please feel free to contact me. >>> STATUE # 2 <<<. >>> Please make sure to watch the video on youtube in 1080p HD. Please note that these are two different videos, please watch both!!!! One of the moments that defined the 1980s and changed the music industry forever was the release of a music video of Michael Jacksons Thriller. A homage to classic horror films. Influenced how music videos were made for decades to come and is still played at events and fans of Michael Jacksons performance. Now you have the opportunity to own a unique one-of-a-kind tribute to the late King of Pop. A truly amazing piece dedicated to the special magic that Thriller brought to the world! 1:1 full scale/Life-size Michael Jackson statue. Constructed in a pose from. The most iconic Michael Jackson work ever. This statue was carefully handcrafted over. To ensure that every single detail was true to life. If you are a Michael Jackson collector, then you likely already know that this is strictly a one-of-a-kind statue of Michael Jackson. At 59 tall, this statue is 1:1 scale. 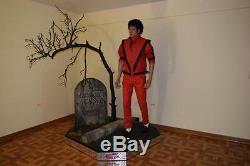 This Michael Jackson Lifesize Statue comes with the CERTIFICATE OF. 48" x 62" (122cm x 157cm). The eyes are constructed from the. In order to produce a realistic look. Even the slight small veins in the eyes are visible. Additionally, the nose, mouth, cheek structure, and overall skin tone have been carefully crafted in order to mimic that of the pop icon. The figures arms are extremely realistic, with perfect. The hands were carefully crafted and this attention to detail can be clearly seen in the cracks and grooves of the fingers and even the slightly. Elevated presence of major veins. Perhaps one of the most impressive features of this work of art is the implementation of the. Just as it appeared on screen. This includes the classic J. Park jacket and pants along with shirt, socks, and penny loafers all of which are vintage. Adding to the overall quality of this work is the fact that Michael Jackson. He comes programmed to recite the entire Planet Earth poem but. Can be reprogrammed to say virtually anything (there is no limit). Built into his mouth in order to facilitate the impression that he is actually speaking. Simulating the look and feel. It is carefully etched with the King of Pop inscription and. Accurate birth and death dates. In this tribute to the pop sensation. Meanwhile, the texturing of the gravestone is perfectly done in a manner that would make it easily fit into the classic. This statue also includes a withered, dreary-looking. Tree nearly identical to the one from the Thriller video. Can be adjusted in a variety of ways. This tree completes the overall aura of the piece with its ominous and foreboding appearance. Plus, it can even be rotated. The realistic curb is made of. And serves as the primary divider between the main piece and the cemetery. The King of Pop stands upon a sturdy, structurally sound base which features. Tread plating, adding to the overall 80s look and feel of the work. Atop the base is real asphalt, drawing the viewer immediately into the classic street scene from Thriller. Adorns the side in professionally laser cut lettering identical to that from the famous video. Powerful 700 watt 5.1 custom speaker surround sound. And can store up to 9,999 songs. Thats right It can store and play nearly. You can use the touch screen control on the back of the gravestone or an infrared remote control to adjust any or all of the speakers and subwoofers. You can choose between two or six channels along with the standard on/off, mute, play/pause, track selection, 0-9 buttons, sleep/repeat and volume controls plus much more.... Built into the display base. That project moving light and create amazing Thriller -like effects and atmosphere. This component paired with the sound equipment thoroughly transforms this from a mere statue to a clear work of art honoring the historic performer. Plus, just turn off all the lights in the room and these blue light projectors will draw you right into Thriller , casting shadows and providing a zombie-like appearance to Jackson. 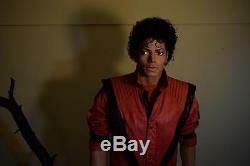 This Michael Jackson Thriller work of art is a must-have for anyone who is a serious collector. The detailed appearance and craftsmanship rivals anything found in Madame Tussauds. That artist for this piece, was inspired to create it due to. This piece has the complete package of carefully detailed features, authentic vintage wardrobe , gloomy Thriller -style setting, and state-of-the-art sound and lighting that would make it the ultimate centerpiece for any collector. This is your one and only opportunity to own this piece of pop history. This Michael Jackson Statue comes preloaded with all the albums you see in the photos below. >>> STATUE # 1 <<<. There is no other statue like this in existence!!! 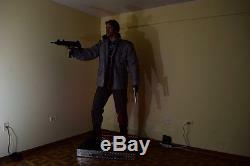 This is 1:1 Full Scale/Life-size TERMINATOR statue constructed in a pose from Police Station Shootout scene. 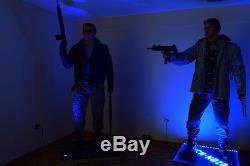 The Terminator (Police Station Shootout) 1:1 Scale LIFE-SIZE. Plus, he was made with incredible attention to details to look just like in the 1984 Terminator film. His human eye is the highest quality orthopedic glass eye and has every single small vain visible just like the real human eye. This statue also features real hair including eyelashes. Moreover, sweat effects were added to make his skin look even more realistic and human like just like in the. 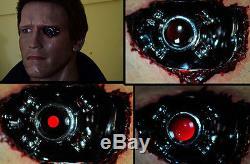 The Terminators robotic endo-eye looks just like in the Terminator film, This ENDO-EYE features a built in glass lens which resembles the CAMERA , GORE, BLOOD like effects seen in the TERMINAOR film. The Terminators ENDO-EYE is remote controlled lights up and was chromed with the highest quality chrome >> The REAL Chrome<<. The hands were carefully crafted and this attention to detail. The Terminator wears a custom made deerskin leather gloves. These gloves are composed of interlocking fibers making it a durable, and most of all screen accurate. Police Grade Black Leather Motorcycle. And pants along with shirt, and motorcycle boots. The Terminators Police Grade Black Leather Motorcycle jacket is Limited to the year 2009 in honor of the 25th anniversary of the film. This particular limited edition jacket has been created exactly as it was worn on screen. This MEGA RARE leather jacket is Brand New, it still has the original Terminator tag still attached. Terminator also wears IDENTICAL Original Lunar Gray VINTAGE 1984 GARGOYLE sunglasses as seen in the movie. These boots were taken and AUTOGRAPHED at the COMIC BOOK and SCIENCE FICTION CONVENTION in 2003 by various actors, such as: Arnold Schwarzenegger, Kristana Loken (Terinatrix), Nick Stahal (John Conor), Jonathan Mostow and Stan Winston. The When you press hidden spots located on his chest it makes the Terminator say (with an AUTHENTIC -Terminator VOICE) different phrases that Arnold Schwarzenegger actually spoke in the film. The display base features a Extremely Powerful custom made speaker that PLAY 26 tracks of music. Including Domestic and Foreign Theatrical Trailers. The Display Base also features a built in blue light Projector, which projects a MOVING blue light that creates incredible Night, Smoke, like effects and atmosphere seen in the movie. You have full control of the statue/display base. In the making of the Terminator movie theyve used. This RARE Franchi SPAS-12 combat shotgun. Is the Highest Quality replica shotgun constructed of Metal/Plastic available on the market today. Has a SUPREME craftsmanship & TOP NOTCH finishing. Moreover, The Terminator also holds a AR-18 rifle. This selective-fire rifle is identical model as seen in the movie, chambered by 5.56×45mm NATO ammunition. This AR-18 (ArmaLite) Assault Rifle. Is also top notch quality as well as the other statue weapons is. This AR-18 (ArmaLite) rifle was made in the late 80s. It is an exact replica as the one used by Arnold Schwarzenegger after he had bought it at the gun shop. This RARE assault rifle features a Metal / Plastic body. It also features two electric taped Metal Magazines, each magazine stores several empty --RealRounds. This is no longer a live ammunition anymore and it does not CONTAIN NO PROPELLENTS NOR EXPLOSIVES BOTH WEAPONS ARE TOTALLY SAFE. AMMUNITION DOES NOT CONTAIN PROPELLENTS NOR EXPLOSIVES. If youd like to see MORE pictures or have any questions please feel free to contact me. ===== I ACCEPT ALL KINDS OF PAYMENTS =====. The item "Michael Jackson LIFE-SIZE Thriller Statue Terminator Bust Figure 1/1 Movie Prop" is in sale since Friday, January 01, 2016. This item is in the category "Entertainment Memorabilia\Movie Memorabilia\Props\Originals". The seller is "dehans1985" and is located in Chicago, IL.